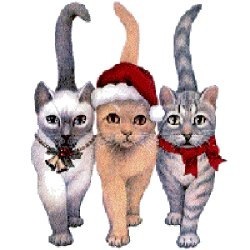 The Board, Members and Volunteers at Central Paw would like to wish everyone a very Meowy Christmas. We’d like to remind you not to drive impaired and if you suspect anyone who is driving impaired – CALL 911 from your cell to report it. Since August 2011, Central Paws has been super busy raising money and spaying/neutering mostly cats. We’ve spayed/neutered 19 animals (18 cats + 1 dog). Many were abandoned in barns, others were ferals and are now in maintained colonies supervised by volunteers. We’ved helped some cats belonging to owners on fixed income. In 2012, we are aiming to triple that number, especially considering we are hoping our program director won’t be away for 3 months in 2012. We would like to say a big thank you to those who have volunteered, to our foster care people, to the people who do the fundraising and to the donors. Have a safe Holiday! Look out … Our Program Director has been working hard while she’s been away making sure when she gets back … we are off and running with our fundraising. In the meantime, we could always still use your help with your donations.